For some reason liberals appear to be determined to ruin every holiday for their families. Imaging having to sit at a table with these people and have a good time as they find new ways to deride you for not being as “woke” as they are. And now they are writing guides on how to ruin your holiday. On Wednesday Teen Vogue published a story advising teens on how to ruin their family’s Thanksgiving by preaching to them about the evil whit colonizers who destroyed the Native Americans. In the United States, so much of what Americans are thankful for — our families, homes, the foods we enjoy — are the products of ongoing colonization. We might feel grateful for the place we grew up, but that place exists on stolen land. Coming together with family can be challenging, as we all have different ideas of what “America” is. Yet, if there’s one thing many folks can agree on, it’s that in the history of this country, Native people were wronged. With the arrival of European settlers, an estimated 90% of the millions of Indigenous peoples — a number debated to be between 20 and 100 million — died. It wasn’t just from disease: The colonizing settlers enacted genocide of Indigenous peoples through starvation, torture, and massacres. It may be true that the “first Thanksgiving” was a peaceful gathering of Pilgrims and Wampanoag people, who together celebrated the Pilgrims’ first harvest in 1621. But given the massive genocide their ancestors experienced at the hands of European colonizers, it’s hard for Indigenous folks to see this holiday as anything other than a national day of mourning. Native peoples continue to fight for their lands and sovereignty while facing exceptional rates of poverty, suicide, and sexual violence, so it’s way past time for more Americans to acknowledge the difficult truths at the heart of Thanksgiving. If you’d like to do your part to help rewrite the story at your gathering this year, here are some ways you can start working toward a more just future. 1. Do your research. Ahead of the big holiday meal, read up on the truths that define Native histories. 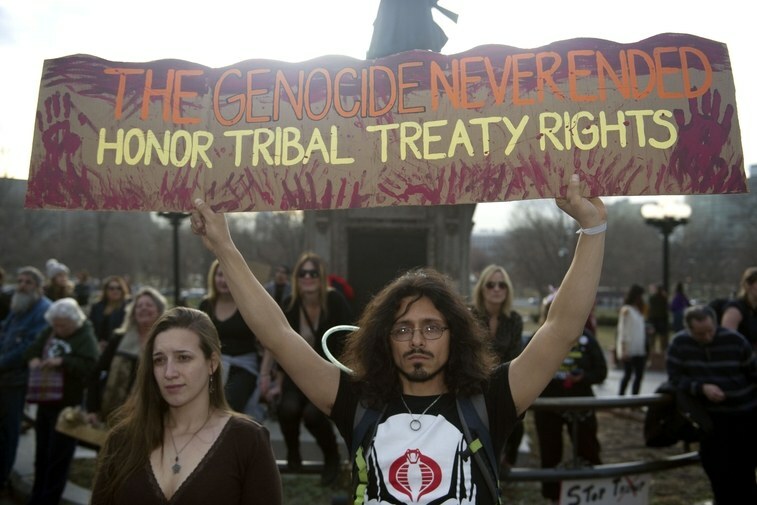 The modern U.S. is home to more than 600 Indigenous tribes and nations. Do you know whose lands you live on? The map at Native-Land.ca is a good place to start, but as you dig deeper, you may find that there isn’t one answer; these histories are complex. Native tribes did not “own” the land, but they have continued to steward and protect it, while having their sovereignty stripped over time through an endless trail of broken treaties. Take time to learn how you can support the efforts of tribes in your region. 2. Look before you leap. When it comes to talking about colonization, there’s plenty of reason to become emotional. Your relatives might not understand your passion, and you’ll want to make sure you’ve put in the work to educate yourself. Blackfeet writer Abaki Beck and Showing Up for Racial Justice (SURJ) offer helpful Thanksgiving resources. Reclaiming Native Truth’s “Guide for Allies” can help you identify and challenge harmful ideas about Indigenous peoples. Consider planning an acknowledgment of Native peoples and talk to the host of the meal in advance to determine when you’ll offer your piece. 3. Share what you’ve learned. A great way to do this is by offering a formal acknowledgment at the start of your Thanksgiving meal. Such statements fight the invisibility of Natives and recognize their enduring relationship with the land. An acknowledgment can be brief — “This gathering is taking place on occupied Cherokee lands,” — but a longer, more thoughtful statement may have greater impact. Read and share the #HonorNativeLand guide to deepen and spread this practice. You can also acknowledge the Native communities of today by sharing news of recent successes, like the two Indigenous women who will soon join Congress, but still, refuse to ignore difficult truths, explaining the fact that Native rights are currently under attack by the government. 4. Challenge Thanksgiving myths. The Pilgrims at the center of Thanksgiving lore were not friends to the Natives; they actively worked to exterminate them. President Abraham Lincoln, who made Thanksgiving a federal holiday, also had 38 Dakota men hung. “Looking at Thanksgiving from a real historic [lens], rather than a mythical historic perspective, is huge,” Michael Roberts tells Teen Vogue. Roberts, who is Tlingit, helps lead Reclaiming Native Truth and explains that even the familiar symbols of the holiday are inaccurate and conflates Native identities: Those paper headdresses that adorn Thanksgiving decorations, versions of which kids make in school, “are cultural images of Plains Indians, and not the Wampanoag that the Pilgrims actually spent time with,” he says. 5. Bring something different to the table. Comeaux says that Thanksgiving has its roots in old harvest celebrations, which are not unlike some Indigenous rituals that “give thanks to the plants and animals that nourish us.” To foster this “reciprocal relationship with the earth,” you might skip the supermarket and make a dish that features foods obtained through “gardening, hunting, gathering, or with locally produced items,” especially foods native to the area. 6. Play into the day’s pre-existing traditions — like football. It’s a Thanksgiving tradition as much as the turkey. If you want to give a shoutout to a Native hero that will impress even your sports-loving grandpa, talk to him about Jim Thorpe and the 1899 Carlisle Indian School football team, who “transformed the game into the thrilling high-speed chase it is now,”, according to NativeVillage.org. Thorpe’s skill is the stuff of football legends, but the less-often discussed history is about Carlisle itself: it was one of many U.S. boarding schools that used cruel tactics to assimilate Natives and destroy their cultures. These are facts we can’t ignore, and ones we must acknowledge.